A survey of more than 50,000 European and US mobile users conducted by The Nielsen Company on behalf of Tellabs indicates that the mobile boom might finally be upon us. Of those surveyed, 71 percent anticipate they will use the mobile Web daily over the next two years. Perhaps the most important finding is that of the countries surveyed - US, UK, France, Germany, Italy and Spain - users plan to increase their mobile Web usage over the next 12 months by an average of 41.2 percent. In the US alone, that number is 52 percent. The top five services that will drive an increase in mobile Web and data services usage are mobile Internet, e-mail, photo uploading and multimedia messaging (MMS). And there are some differences in how these services will be used, according to region. US consumers will explore the mobile Web, while European countries will lead with MMS. According to the survey, "a work-oriented" lifestyle drives mobile data services in the US, while in Europe it's more oriented to entertainment. But the top driver of all mobile services is convenience. From the study: The top driver of the trend toward increased mobile internet and data usage is consumers’ expectations of how they will add convenience and improve their lifestyle, and how this aligns with current capabilities of the mobile platform, Tellabs said. This should serve as a clear roadmap to any company's mobile plans. 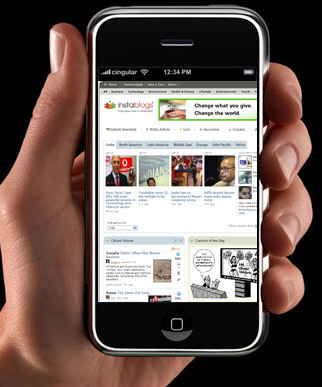 Whether through an iPhone app or a mobile version of a website, the goal is to give the user convenience. If you're a brick-and-mortar retailer, that means including a click-to-call phone number, and click-to-map address at the top of the page, in a prominent place. If you're a content publisher, it means providing easy navigation, and quick-loading pages stripped of moving parts and bulky images. Mobile has been touted for many years now as the next, great medium. It's true that the industry has "cried wolf" several times before, but with the upgrades to the iPhone operating system, the G1 Google phone and now apps for BlackBerry, the time is closer than ever before - and getting closer, faster. Even low-cost mobile devices are getting online, and there are plenty of those to go around, to all parts of the world.